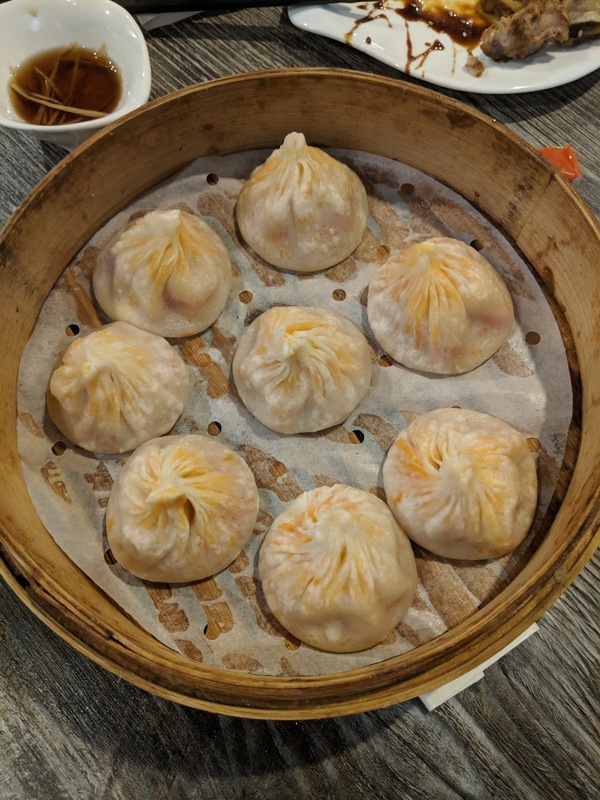 Quick Look - I-Shanghai Dumpling - best dumplings in Sac! I've been keeping a secret because I wanted to be the first to break the news. 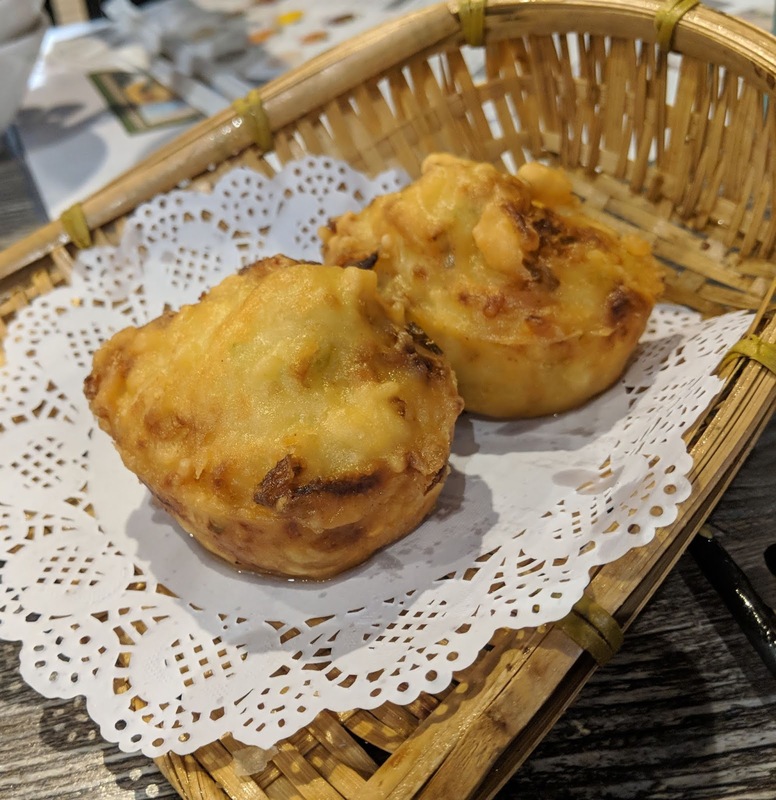 There's a new dumpling place in town. Well, actually, it's been open for nine months. Somehow it's been a well kept secret and now I'm telling you. 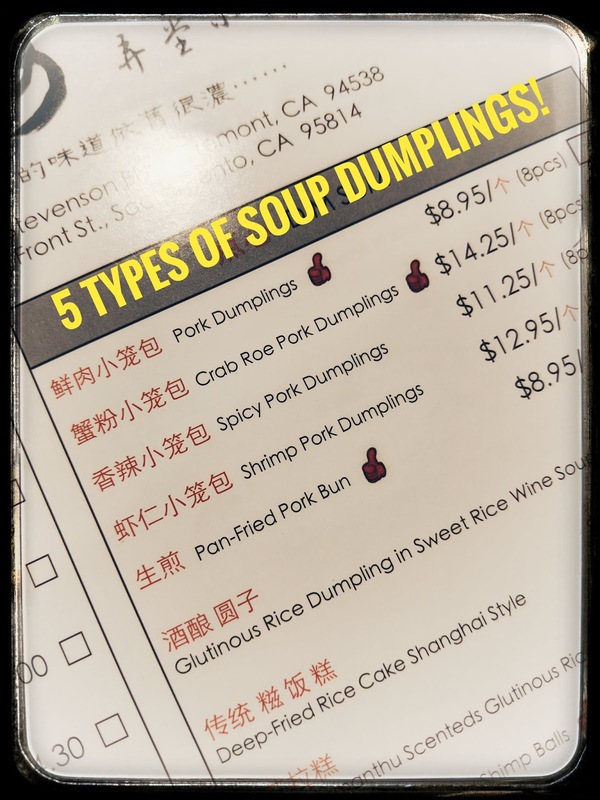 The best soup dumplings can be found in Old Sacramento at I-Shanghai Delight. My friend and past coworker from CalPERS told me about it. She's Chinese and she said that word had already spread among the Chinese community when this new location (the first is in Fremont) opened up. Then my other friend is a soup-dumpling fanatic. I knew I had to go with her to try it out, especially when we learned there were at least three varieties of soup dumplings! 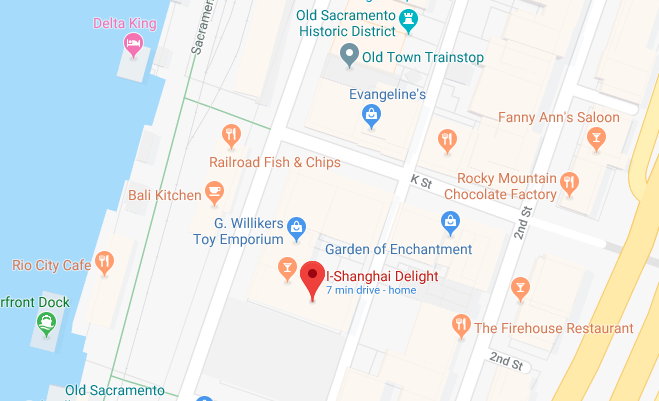 I-Shanghai Delight is located on Front Street in Old Sac. It's in the basement of the old set of buildings that are directly across from the railroad shed where Bali Kitchen is. As soon as you descend the stairs you see people making soup dumplings! The restaurant is bigger than it first appears because the dining room wraps around the back of the bar and dumpling making area. 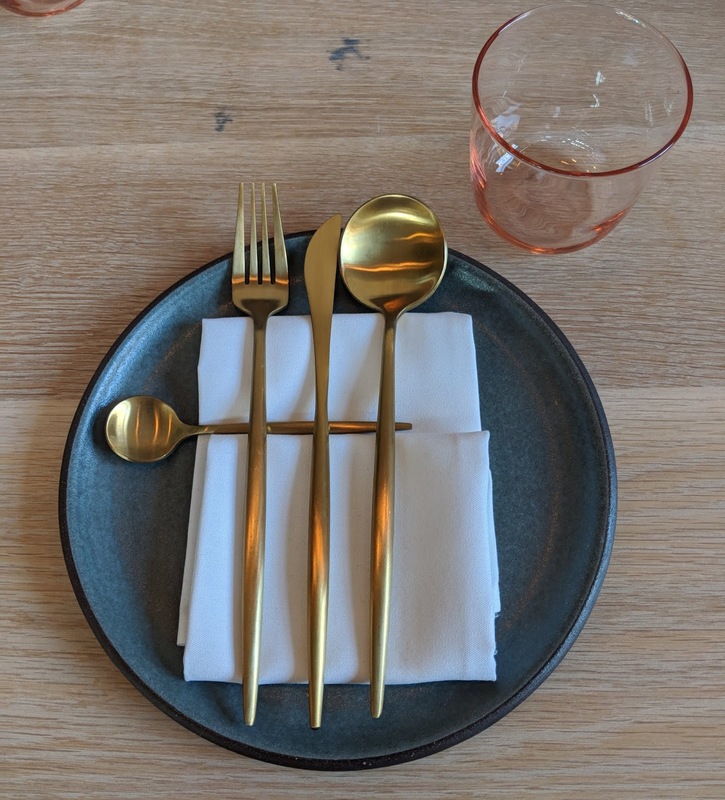 It's bright and clean and you get excited about your upcoming meal as soon as you sit down. 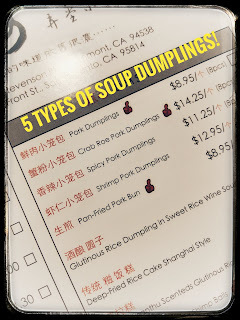 The menu is not lengthy, probably because the feature is the soup dumplings. There are five versions to choose from! Pork, shrimp, spicy pork, and crab roe and pork are the steamed selections. The fifth is a pan fired pork dumpling. Be careful because they arrive at your table piping hot. You also have to be very careful with how you bite into them so that you don't squirt the soup on yourself. We chose the shrimp, spicy pork, and the pan fried. First up was the shrimp and as soon as you bit in and slurped up that soup, you knew you had found the best dumpling place in town. 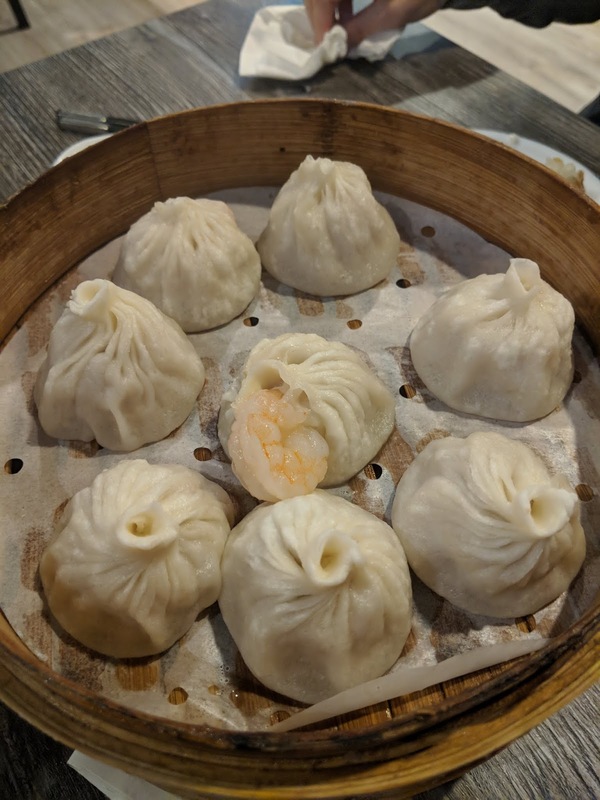 The center dumpling has the shrimp peeking out so that the servers can tell the dumplings apart. Inside is some ground seafood and a whole shrimp, and, of course, the flavorful seafood broth. Under that steamer tray was the tray of spicy pork. 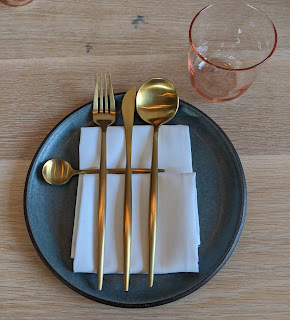 When you bite into these, expect an explosion of broth with chili oil. At first I thought they were mild, but the heat can sneak up on those who are sensitive to spicy food. I like spicy and would consider it to be at a low medium level. The pan fried pork is just fried in a shallow bit of oil so that the bottom halves are nicely browned. 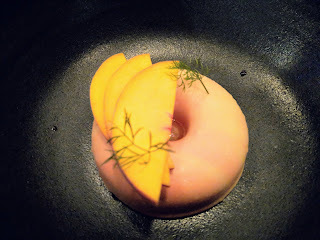 While my companions liked them, I did not care for the bread-iness of the frying. It made the dumpling a lot heavier. Considering it was our last dish and I've been eating low-carb for eight months, the heaviness did me in. 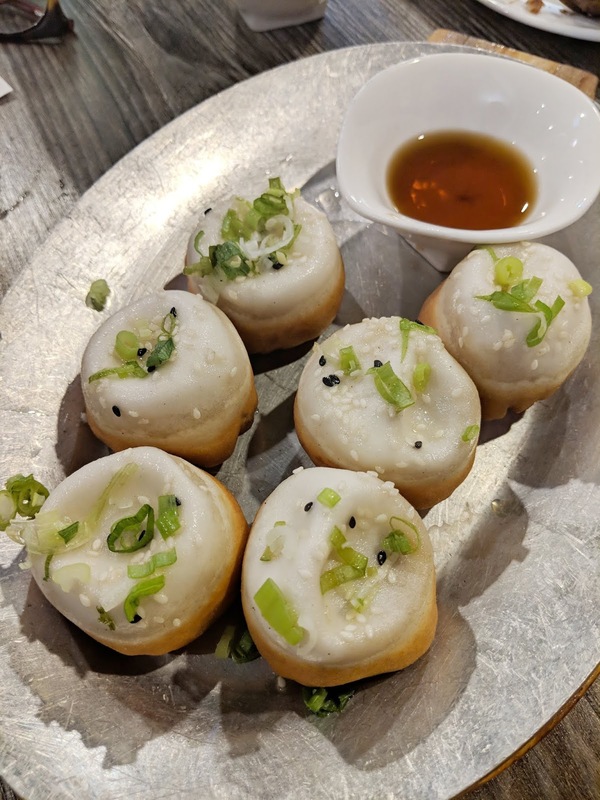 I had enjoyed the other dumplings as-is, savoring their ability to stand on their own without need of condiments such as the accompanying vinegar sauce or the nearby soy sauce. The pan fried dumplings were the only ones I used the vinegar sauce on and I think it helped to cut that heaviness. I skipped directly to the dumplings, but in reality we had started with two appetizers. The first was sweet and sour pork ribs (no picture). These are the small, bite-sized pieces of ribs that you pop in your mouth and crew around the bone before spitting it out. These were covered in a sticky, thick sauce and the ribs were on the chewy side, making it a bit of a chore to munch on. We were wowed by our other appetizer - the Fried Turnip Cakes. These are made with a mix of shredded turnip and green onions. I probably should have taken a picture of them cut in half so you can see the shredded nature of them. 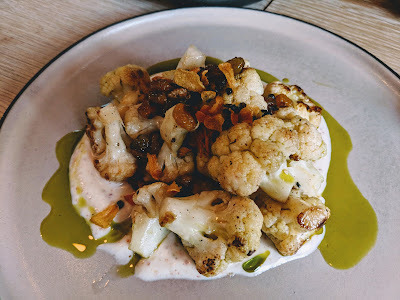 While some might add a sauce to them, I liked savoring the oniony flavor and the texture of the crunchy exterior and soft (bit greasy) interior. So there you go. 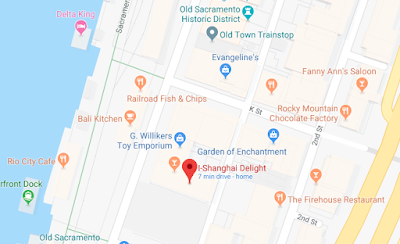 THE BEST soup dumplings in town are conveniently in the center of the region in Old Sacramento at I-Shanghai Delight. For about 15 years I worked for a boss who was raised in New Orleans. Just as any native is picky about their own regional/ethnic cuisine, so was he. It says something that Sandra Dee's had his patronage and the rest of us with him. In fact, it turned out that his wife and Sandra Dee both came from the same town. 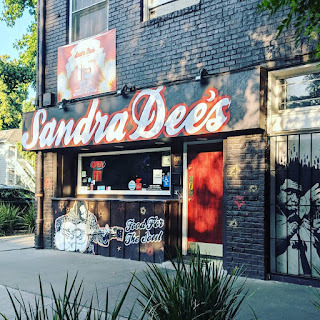 We were regulars at Sandra Dee's, coming to dine at about twice a month. Then again, that was 10 years ago. This is what I know. I know I loved the ribs and the spicy barbecue sauce she has that I always get on the side. I still do. I used to sometimes order a quart of mac and cheese to-go. We all loved the fried chicken and I still think of the revelation I had when I first tried it. I had been ordering ribs and hot links forever while a co-worker would order the chicken. I finally decided to try it and was surprised at how crisp the skin was and moist the chicken was. I'll admit. 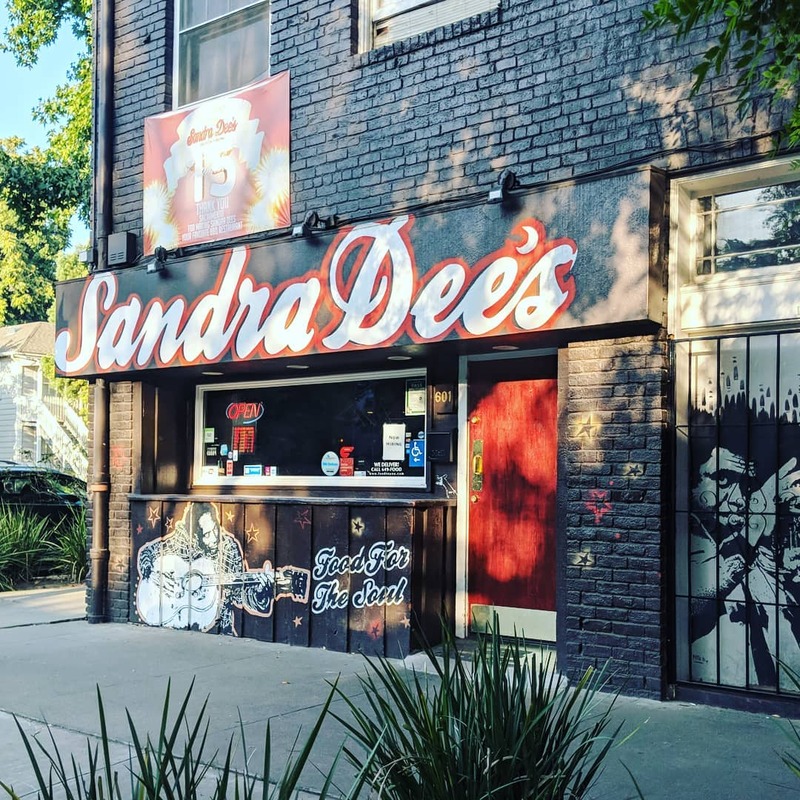 I haven't been to eat at Sandra Dee's in a long time. My boss retired, then I did. My new job doesn't allow for long lunches with coworkers like I used to do at the State. 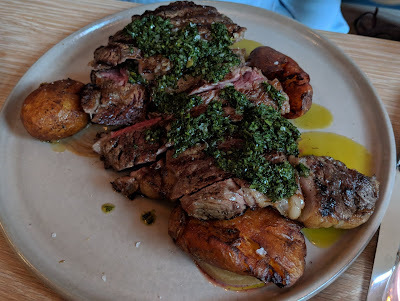 And with so many restaurants constantly opening, it's hard for me to keep up with the new ones, let alone frequent my favorites. Meanwhile, there have been many new barbecue restaurants that have opened: Fahrenheit 250, Tank House, and now Urban Roots. In the Southern category is South - walking distance from my house. 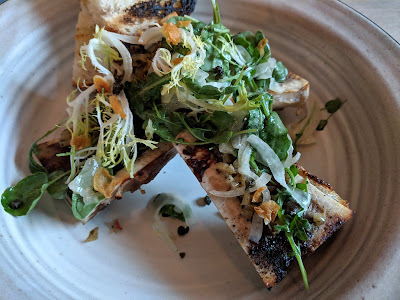 I've never tried Tank House and the others I was unimpressed with. Keep in mind, I'm in it for the ribs. I'm not a chicken or brisket person. I'm all about the oink. I guess I'm in favor of Kansas City style, but with the sauce on the side. I like dry rub and then being able to dip my pieces of meat into a little bit of sauce instead of becoming a sticky mess trying to eat sloppy ribs. I don't care for mustard (So Carolina) or too much vinegar (No Carolina) and Texas BBQ is way too smokey for me. The point is, of all the places in town and all their different sauces, I like my ribs from Sandra Dee's. They are fatty, tender, and I get that great, spicy sauce to dip into. 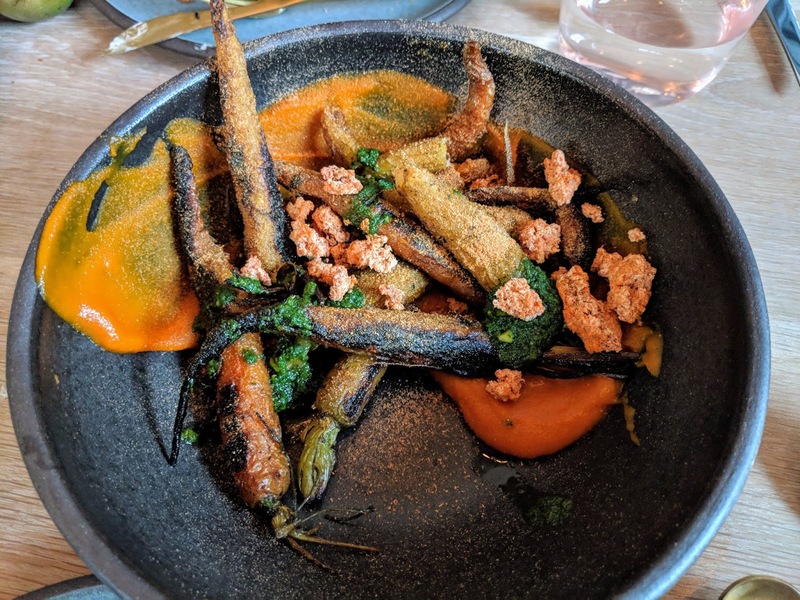 When I heard that Gordon Ramsey had been in town in December to turn the restaurant over, at first I was miffed that I didn't hear about it or get invited. Then when the stories came out that she went back to her old menu the next day, I defended her. There was nothing wrong with her menu. I figured she just wanted the makeover of the restaurant and the publicity so that she would get back in everyone's mind. With so many restaurants opening up, I could see her lose business as everyone shifts to the newest places. 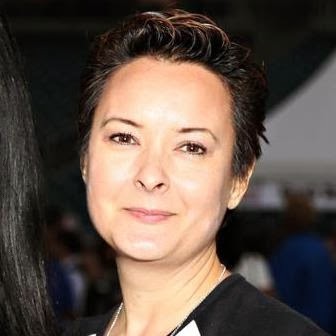 Restaurateurs can get lazy over time and that appears to be what happened with Sandra Dee. 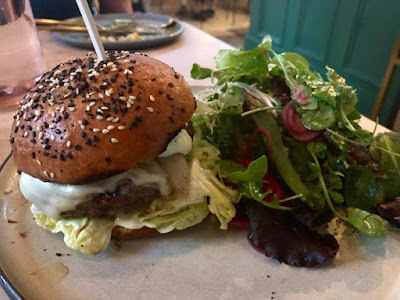 She was losing business and it appears that over the years her food quality had tanked, not to mention the service due to her daughter at front-of-house. Watching the episode a few days after it aired, my heart sank. I had been supportive by going by and picking up ribs that night. They were as good as I remembered. But to watch the episode and see how horrible the cleanliness (or rather, lack of) was is definitely sickening. Then there was the cussing, bullying, and rudeness of her and her daughter. The apple doesn't fall far from the tree and that was evident in the episode. If she can keep going, I will try to stop in again to actually dine in the restaurant and observe. I'm curious to see if anything stuck from Ramsey's visit besides the decor. Did their service improve? Has the food gone back to how good it was those years ago when I went with my boss? We'll see. I'd love to hear from others that have been recently in the comments below. After months of waiting, it's open! Beast + Bounty opened this week and the wait has been worth it. Best friends are in the kitchen with chef Brock MacDonald heading the kitchen and Edward Martinez handling desserts and baked goods. Beast + Bounty is located in the Ice Blocks area of Midtown in an area exploding with newly constructed apartments and retail. (Note that it isn't in the actual Ice Blocks complex itself, but across the street next to Philz Coffee.) The restaurant retains one old-brick wall with modern touches of large windows, bright but muted colors, and contemporary furnishings. There's a small waiting area next to a staircase where they had a (occasional) DJ placed seen in pictures of their soft opening. The Bounty dishes will attract any veggie centric diner. The Cast Iron Cauliflower is atop a layer of a vegan creme fraiche. 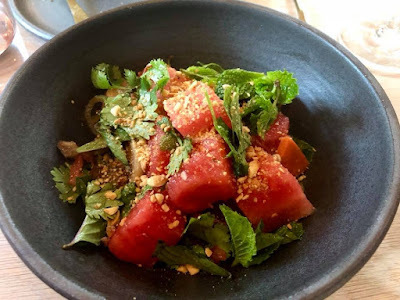 Roasted Carrots with multiple 'carrot' elements was our favorite veggie dish and the Watermelon Salad with Thai eggplant, and pickled radishes was a surprising win. Martinez's influence sandwiches a meal with his soft, warm Parker rolls served with cultured butter aged for eight months. The dessert menu is sure to always be in flux, but includes five items to chose from, including a vegan Soy Milk Panna Cotta with blueberries and maple granita. 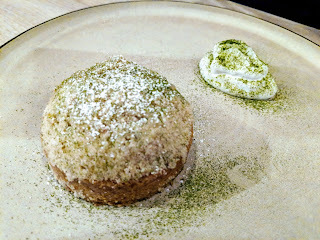 The favorite among us was the Coconut Tart with a rye crust and a tarragon powder. 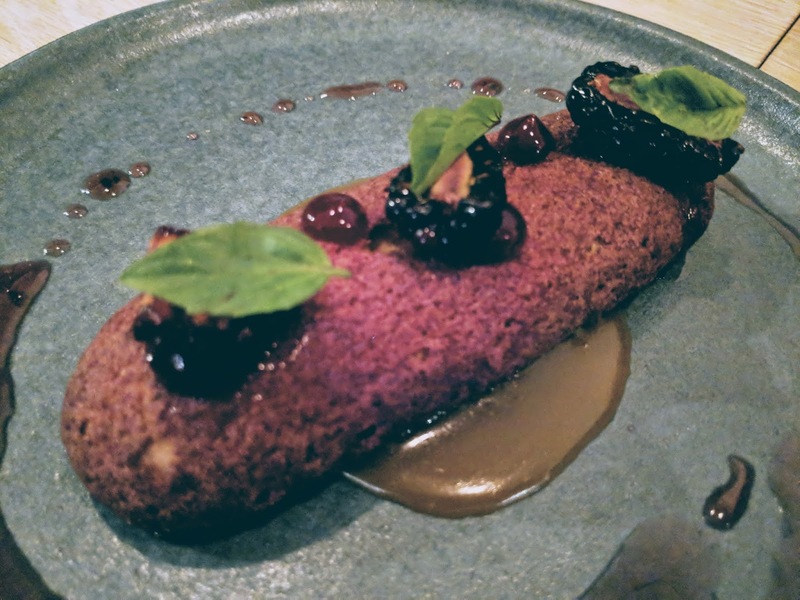 Second favorite was the blackberry eclair with butterscotch. 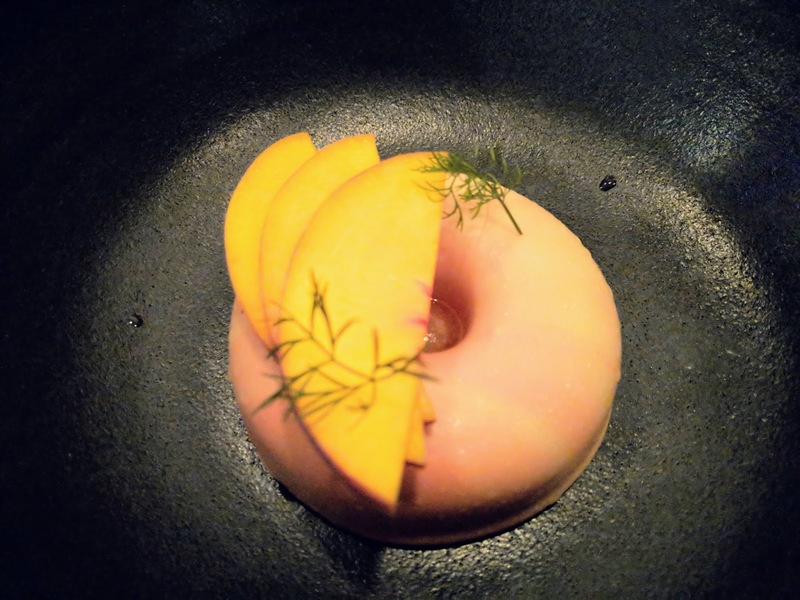 The peach 'donut' is actually a white chocolate donut-shaped shell filled with a gelee. We agreed it needed one more textural element, like a cake base. Martinez will be doing double duty in about a month or so as Milk Money will be located across the walkway from Beast + Bounty. 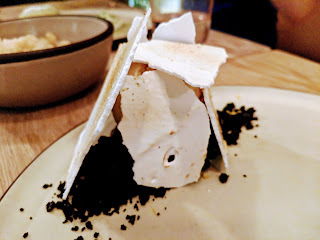 This will be his artisan donut and ice cream shop and houses his ovens for doing the Beast + Bounty desserts. For the last six months Martinez has been hosting donut popups around town, selling out under an hour each time. 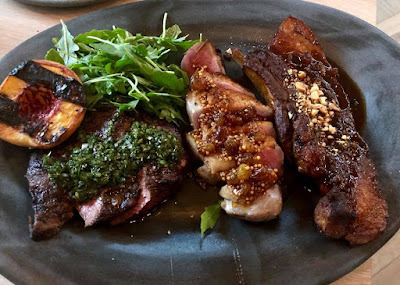 Beast + Bounty is destined to become one of Sacramento's most popular restaurants, perfectly designed to showcase the City's title of Farm-to-Fork Capital.